If you zapped a vanilla Chai latte with a "turn into ice cream" gun, this recipe would be the result. It's smooth, creamy, sweet and delicious, and best of all, it's got just the right taste of all your favorite Chai spices. Now you can have a Chai latte as a hot treat OR a cold treat! Put milk in small sauce pan over medium heat. Add Organic Masala Chai Black Tea. Or swap in Organic Decaf Masala Chai Black Tea for a less caffeinated option! Simmer about 8 minutes, stirring occasionally. Pour into a bowl, using a tea strainer to catch the chai and let set to cool until room-temperature is reached. Chill at least one hour, preferably overnight. 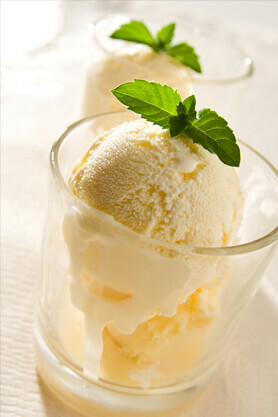 Pour mixture in your ice cream maker. Finish according to your unit's instructions. Enjoy soft-serve or place in a container and cover closely with cling wrap, pressing the cling wrap down all the way to touch the ice cream before sealing the lid on top and then store in the freezer to let it set harder.